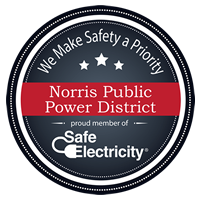 Each year, Norris Public Power District offers one $1,500 Utility Line – Electric Lineman Training Scholarship. The scholarship is awarded to a first year student who has been accepted into the Utility Line Program at Northeast Community College in Norfolk or Metropolitan Community College in Omaha. In addition to meeting the application requirements, all scholarship finalists are interviewed by the Norris Public Power District Scholarship Committee prior to selecting a scholarship recipient. Students who are considering a career as an electric lineman should apply for admission to either Northeast Community College or Metropolitan Community College as soon as possible as enrollment in this program is limited and based on the date of acceptance. Norris Public Power District will send scholarship funds directly to the institution the recipient is attending, and the funds will be credited towards tuition only. Scholarship applications for the 2019-2020 year should be completed and returned to Vicky Jurgens, Norris Public Power District, 606 Irving Street, P. O. Box 399, Beatrice, NE 68310-0399, by December 31, 2019. Download the Electric Lineman Training Scholarship Application form. For more information on the Utility Line – Electric Lineman Training Scholarship, contact Vicky Jurgens 800-858-4707 or email vickyjur@norrispower.com.